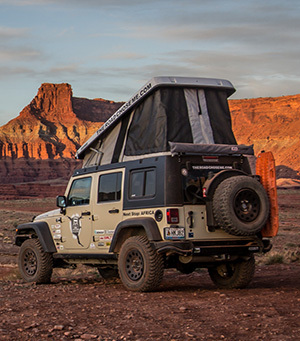 Isolated dual batteries are a must in any Overland vehicle. The setup looks complicated and difficult in photos, though it’s actually very simple. 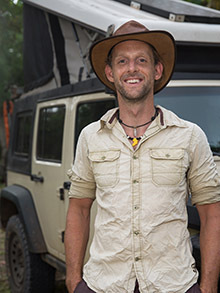 Having two batteries means one can be used only to start the vehicle (let’s call this battery the “Engine Battery”) and the other can be used for all your electrical needs like a fridge, camp lights, charging of devices, running an inverted etc. (Let’s call this battery the “House Battery”). 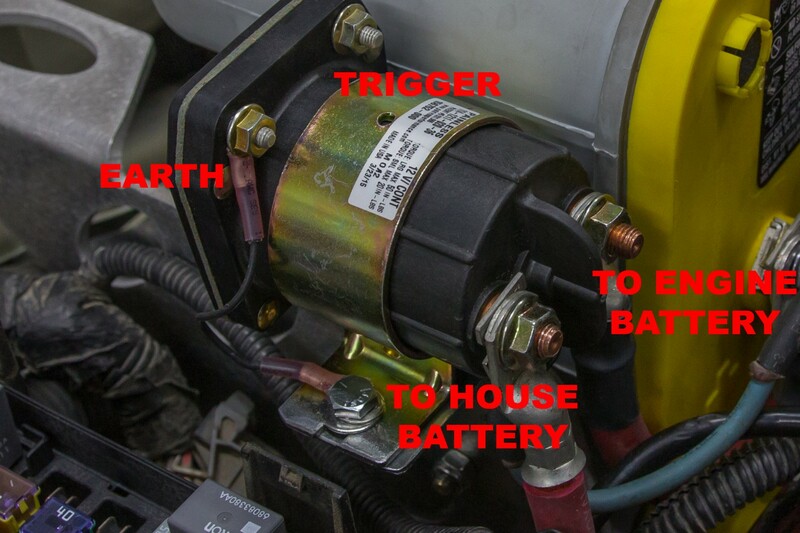 The isolation part refers to how the batteries are connected and disconnected with the engine is running and when the engine is not. When the engine is running, we want the batteries to be connected in parallel (positive to positive, negative to negative) so we still get 12V, and the alternator can charge both batteries. When the engine is not running, we want to separate the batteries, so that if the House Battery is completely discharged, the Engine Battery remains unaffected and will still start the vehicle engine without issue. This “isolator” is commonly a large amperage solenoid that is triggered with an ignition hot wire. Because the two batteries will be connected in parallel when the engine is running, it’s highly recommended to use two identical batteries to ensure even charging from the alternator. A dual battery tray. I have the Nemesis Industries tray which is specifically designed for the Optima D34 batteries. The batteries mount on their side, saving previous space. Heavy gauge wire to connect the batteries, welding wire with crimps already on the ends. From $4.15 From CDN$13.78 on Amazon works great for this. You’ll need one black wire to connect the two negative terminals together, and two red wires to connect the two batteries to the solenoid. Depending on what came with your solenoid, you might need to make a brake to mount it. I used a scrap piece of a right angle bracket I had left over from something else. 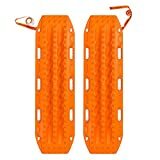 Only basic tools, though the specifics will depend on which dual battery try you use. You really won’t need more than a ratchet and extension bar, a few sockets (at least 1/2 inch and 10mm), some kind of saw to cut plastic (hand or electric is fine). A deep 10mm socket is handy. Follow the instructions that came with your dual battery tray to remove your existing battery and the large factory plastic tray, and install the new dual battery tray. Usually this involves cutting the factory plastic tray. Install the two batteries in the tray – when using the Nemesis Industries tray it’s recommended to install the Hose Battery on the bottom, and the Engine Battery on the top. If your tray mounts the batteries side-by-side or front-and-back, check how well the stock jeep wires for the positive and negative will reach each location. Whichever battery suits those wires the best can be your Engine Battery. Connect the negative terminal of both batteries directly together. These will always be connected with large gauge wire, and never need to be disconnected. Find a good spot to mount the solenoid. You’re going to run heavy positive wires to the large terminals from each battery, so keep it close to the batteries. Check hood clearance, and make sure neither terminal will touch any part of the body nor hood. Install the inline fuse/wire in the JK fuse block in the location indicated on the picture below. This will trigger the solenoid to turn on when the engine is running. Drill a hole just big enough for the wire in the bottom/side of the JK fuse block cover, feed the wire through and put silicon around it to seal the hole from dust and water. Connect the other end to the small trigger terminal on the solenoid. 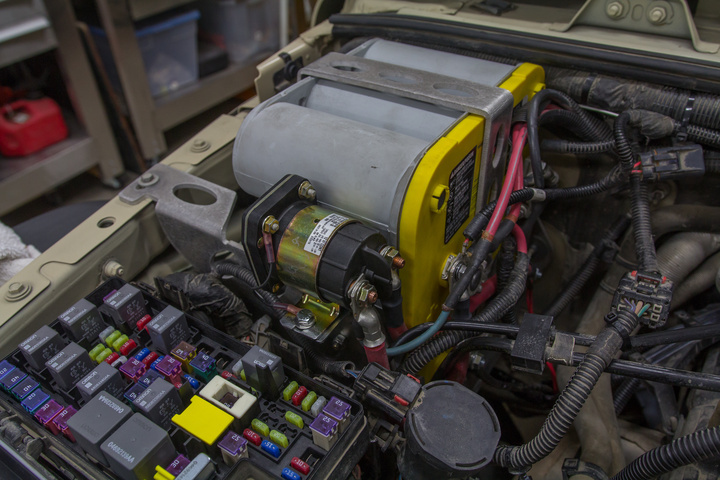 Connect the other small terminal on the solenoid to an earth – this could be the negative of either battery, or the body of the Jeep. Remember, they’re all connected together now, all the tire, so it doesn’t matter what you use, it’s all the same thing. 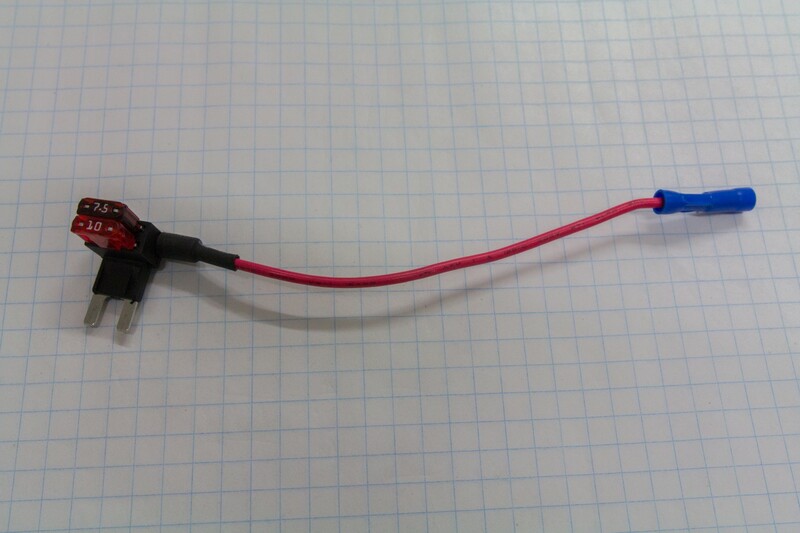 Connect one heavy gauge red wire onto the positive of each battery, and to each of the large terminals on the solenoid. Painless Solenoid with terminals labeled. It does not matter which battery goes on which big terminal. Connect all your accessories (fridge, lights, etc) to the House Battery positive and negative. 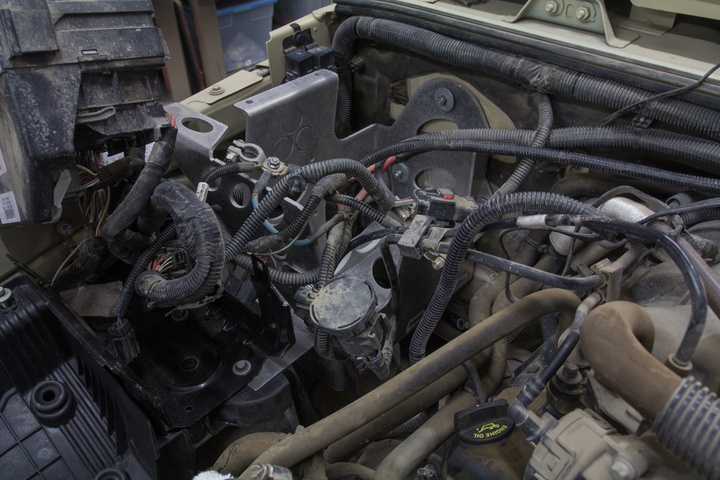 Connect all the stock Jeep wires onto the Engine Battery positive, and then lastly connect the stock Jeep wires to the negative of the Engine Battery. Leaving the negative until last ensures you won’t get a really big spark if you accidentally touch something to the body during the whole setup. Zip tie like wires together and out of the way, and attempt to make everything as neat as possible, which is not easy. 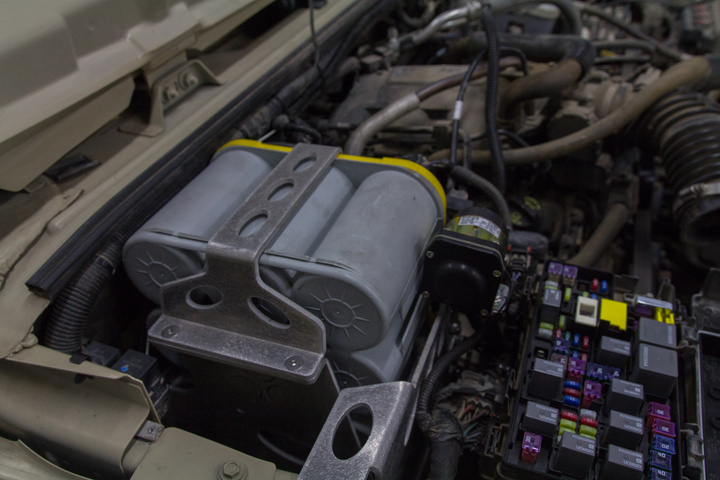 Test out your new isolated dual battery setup – When you start the engine you will hear a “clunk” as the solenoid connects the two batteries. You will hear the same “clunk” when you turn the engine off again. Enjoy hours of lights and icy cold beverages without worry of draining your Engine Battery! I decided not to use the switch at all, I wanted everything to be fully automatic. Just don’t wire in the switch at all. Put the two big lugs on the solenoid to each positive of the two batteries. Join the two negatives directly together. One of the small lugs goes to ground, the other one goes to a wire that’s hot when the engine is running. So now the solenoid will automatically connect the batteries together when the engine runs, and it will disconnect them when the engine is turned off, without the need for the switch at all. “Put the two big lugs on the solenoid to each positive of the two batteries. Join the two negatives directly together. One of the small lugs goes to ground, the other one goes to a wire that’s hot when the engine is running. …is EXACTLY how I suggest my customers install house batteries and isolators. Thanks for the input, glad to hear it! I’ve been running the system for over 2 years now, and it works perfectly. I’m really happy with it! 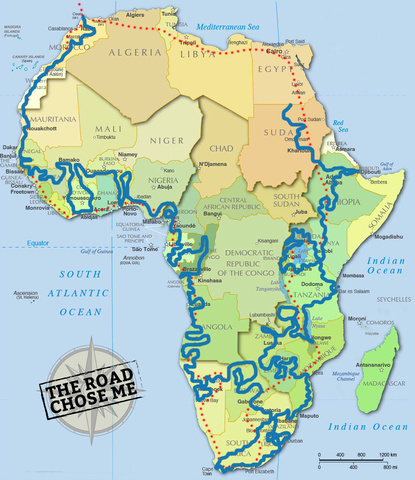 You are gonna get stuck. The way you wired it disconnects one battery when the car isn’t running. If you disconnect the car battery, and the other battery runs flat, you can’t get it started, and until it is started, the solenoid can’t kick in to turn on the car batt. That’s not how I wired it, and I already tested it out by completetly draining the house battery accidentally. The engine fired right up no worries off the engine battery, then the solenoid kicked in, joined them, and the alternator recharged the house battery. Any stock un-switched current draw will still draw from your starter battery, instead of house battery. So leaving dome lights on will still drain your starter battery instead of your house battery in this configuration. Or switched accessories like the stereo are still on the Starter battery and not the house. Did I miss the part in the setup where you moved these items to the house battery? You are 100% correct, and I did not move those items to the house battery. On the Jeep those things turn off after the key has been out of the ignition for a few minutes, or as soon as a door is opened. I also don’t have any stock dome lights, I installed my own on switches. You are absolutely right though, if I did something like have the key in the ignition playing the radio for hours and hours I could drain the starter battery, so I still have to use my head in that scenario. 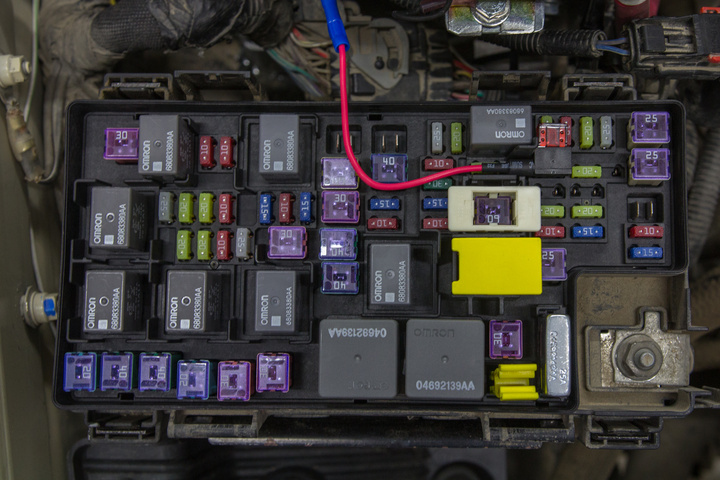 Could you use a manual switch instead of the solenoid? In theory, yes, but you’ll need something that can handle a couple of hundred amps of current, which is not easy. The Painless kit I used comes with a three position switch so you can decide how it works. Position 1: the system functions like mine – auto connect and disconnect. Position 2: The batteries are always bridged. Position 3: The batteries are never bridged. So by wiring it up according to their directions, you’ll have the best of all worlds, and ultimate flexibility and control. Love the instructions and thank you for putting this up. I followed them, but my battery light is now on. Did your battery light come on after this setup? No, it did not…. did you mess with the alternator wiring at all? 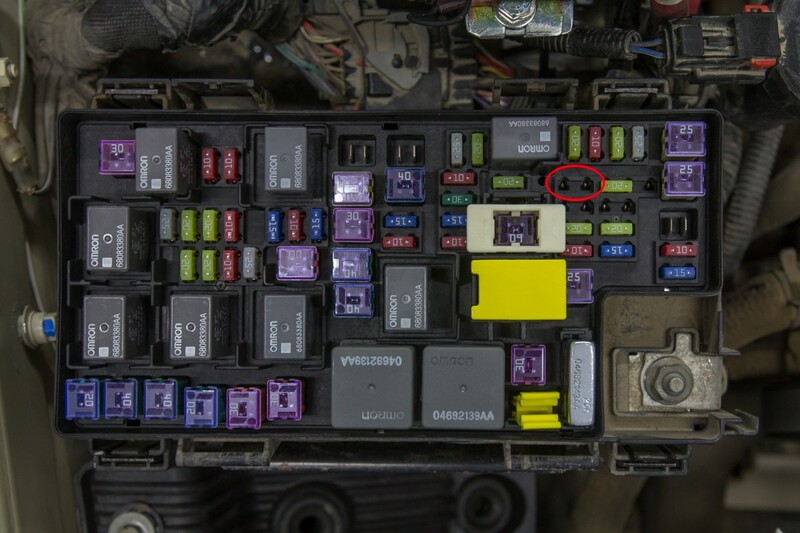 Is all the original “Jeep” wiring still connected to the main battery + and -? I did not mess with original wiring at all, just followed your setup. Hmm, that’s an interesting case. I’d be interested to hear if you get to the bottom of it! I also got the battery light. AutoZone said my stock alternator is just barely putting out 12V which isn’t enough. I have a new alternator coming which should fix it hopefully. That’s really strange, I hope the new alternator fixes the problem. It should be putting out 13.8v for sure, so maybe that it..? Please let us know if it does fix the problem!